Details about the UI (user interface) controls included in the pack. The Accordion control is an ItemsControl e.g. 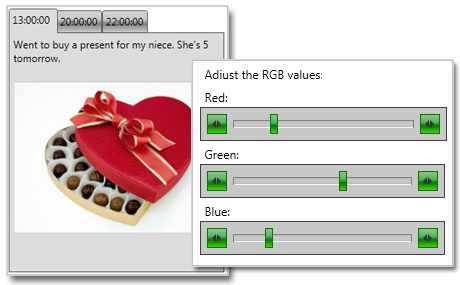 it can contain a collection of objects of any type (string, image, a WPF control like panel, text box etc). The items can be expanded and collapsed. The header of each accordion item is completely customizable through templates. The Calendar control represents a time table, which can be customized to show a single month with its days, an year with its months, a day with its hours and a century with its years. It supports multiple selection of items in any of the views, various events for user interaction and an easy-to-customize interface. Changing the views is also easy - just with a mouse click. 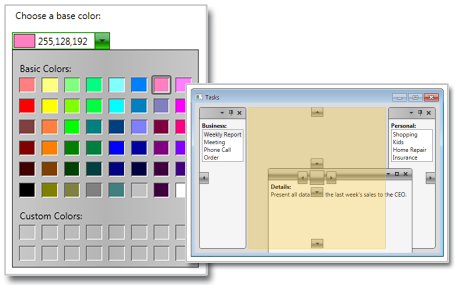 The tab control contains a collection of panels arranged like tabs. There's no limit to the number of tabs as well the content that each one can hold. Tabs can be added and removed at run time, customized through styles and templates. A rich event set provides notification for any action performed by the user. The Slider control can track the change of a value in a given interval or the change in the start and end of a range made of two values. The control can show a label, ticks and measurements and supports styling and templates. All appearance and data settings can be customized. The dock control supports unlimited number of dock items. When you drag a dockable window, visual indicators appear to guide you about the expected position of the item. Items docked in the center are tabbed. Any docked item can be resized according to your needs. Items can be pinned and unpinned, you can also add undockable items. 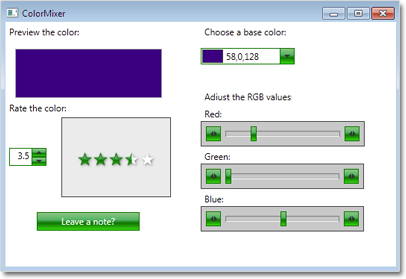 Thecontrol supports the standard predefined colors as well the ability to create custom colors. It is easy to use with plenty of events provided and the possibility to customize entirely the appearance of the control. 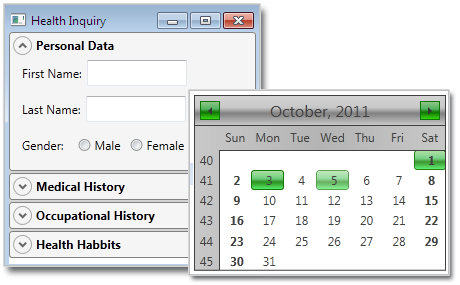 All UI components support data binding, adjustable font, customizable foreground and background, events.